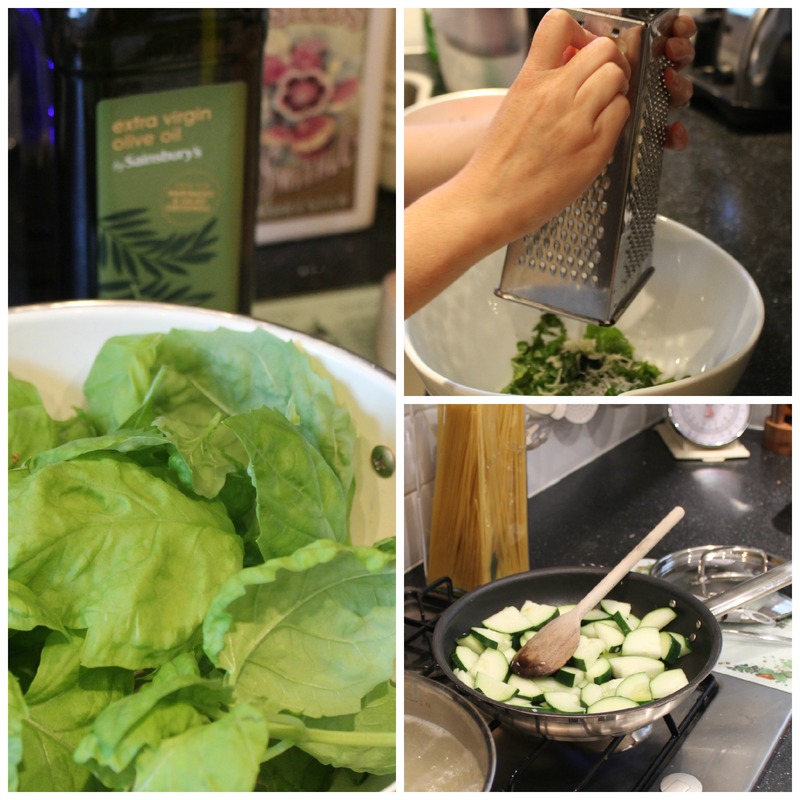 When Ade harvested the first courgette the other week, I decided to team it with the Basil ‘Sweet Green’ we’ve got growing prolifically in the garden to make a fresh, verdant pasta dish. Now, admittedly the title Courgette Pesto is a little bit misleading here – I’m not pulping the courgette to a paste along with the basil, I’m actually sautéing the courgettes in garlic separately and tossing them into the pesto-coated spaghetti at the end. This gives a much more interesting contrast of textures and, more importantly for us since it was the first of our courgette crop, enables you to really taste the courgette. With home-made pesto, you could use a blender or a pestle and mortar, but I find this only creates more washing up! I’m not making vast quantities of pesto to be stored for future use here, I’m making just enough to be served fresh, for two. So, I prefer to chop the basil and garlic roughly by hand before tipping it into a large bowl with the oil. I then bash the hell out of it with the end of a rolling pin! You tip the drained pasta and sautéed courgette into this bowl once it’s cooked, give everything a good stir, et voilà! Chop 1-2 garlic cloves (depending on how garlicky you like it – we like it strong!) and add to the basil/oil, along with half of the grated parmesan and a pinch of salt, before pounding the pesto in the bowl with the end of a rolling pin for a few minutes. While the flavours steep, cook the spaghetti according to instructions. While the spaghetti is cooking, chop the courgette into rounds before halving again and sautéing in a pan with a little oil. Chop the remaining garlic clove and add this to the courgettes. Cook for approx. 5 mins before removing from the heat. Drain the spaghetti and tip into the pesto bowl, stirring thoroughly to make sure the pasta is well-coated. Sprinkle with the remaining parmesan and plenty of black pepper before giving everything a final mix. 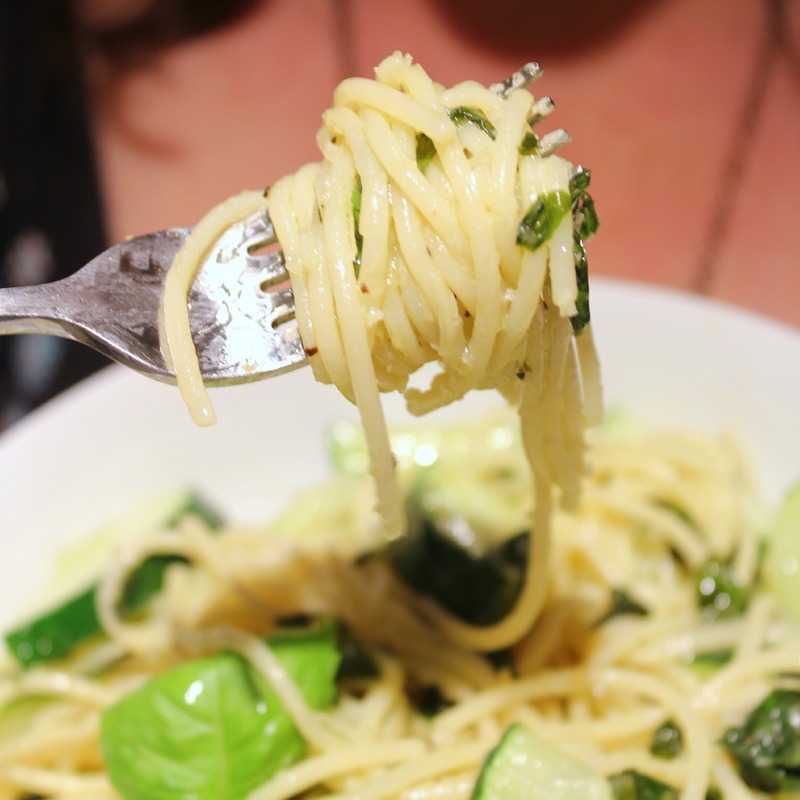 Serve in bowls and top with fresh basil leaves. For such a quick and easy dish, this is scrummy! You could easily add some toasted pine-nuts or thick curls of fresh parmesan on top if you fancy. Go wild. Knock yourself out. Previous Stand By Your Beds! Next Two Fingers to You, Evil Supermarket! Haha! Pesto for breakfast? ‘Nout wrong with that! This looks easy enough. I love pesto as well and I have never had courgette before. Will be something new for me.